Done right, at a fair price, on time. 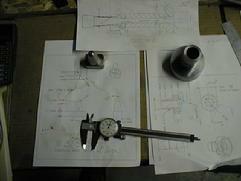 This was a complete package of details that were required to assemble a tire balancing machine chuck. 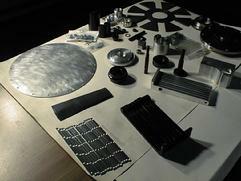 Materials included various alloys and aluminum. 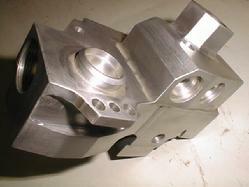 Processes included heat treat, plating, oxiding, machining, grinding, turning. Quantities of the co mponents were 1 ~ 12 pcs. All had to fit right the first time into a functioning finished product that was highly visible to the end user. We paticipated in the design, adding our experience in manufacturing to assure success of this project as well as manufacturing every part of the components to exceed our customers quality requirements. This was a muti station indexing fixture provided with several adapter plates to accomodate several of our customers currently running parts. Additional plates were added by our customer to make this fixture even more productive and adaptive. The final operation was to machine the entire fixture, assembled, to hold +/-.0005 in all 3 axis. This fixture indexed to 4 locations in 90 degree increments. Typical example of a few smaller H-13 details we machined for an assembly used in an injection molding machine. All the items mounted to this machine base, shown here, were designed and manufactured by us to meet the customers test criteria. We were to test the strength of the weld between the small cylindrical tube section and the "clover leaf" shaped cup. We also had to come up with a gripping tecnique and then pull the two pieces apart. We were told to expecte failure of the weld bond at around 8,500 psi. Our first pull measured 13,300 psi and subsequent pulls ranged up to 16,800 psi, ripping the material before the weld bond. Our design was built to handle 34,000 psi pulls, so there were no issues whatsoever. This was a prototype aerospace part. Starting from a solid rectangular block of aircraft aluminum, there were over 30 separate set-ups, whittling away material and producing features to extreamely close tolerances. A total of 16 pieces were produced. The biggest challenge with this part, was processing it in a fashion so as to leave you something to hold onto for the subsequent operations. There were very few parallel surfaces suitable to hold onto as we machined the various features, and nearly none by the end of the process. This was really a very fun project to work on. 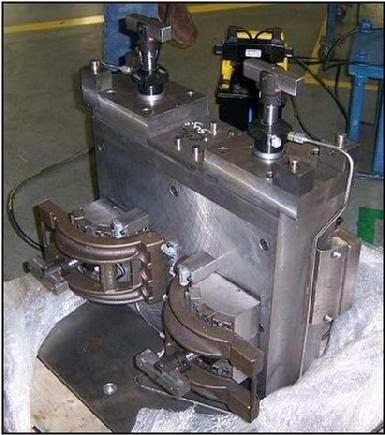 This was a critical machine part that failed and had to be reverse engineered and refabricated. There were no prints or dimensions to go by, only the visual observation of the function of the machine and this broken casting. To date it has not failed again, outlasting the original. Here are a couple fixtures that hold small aluminum blocks (10 per side, 40 in all). The fixtures are mounted on the CNC vertical mills rotary table on one end and supported by a fixed live center on the opposite end. After the machining cycle, the fixtures are swapped out with a fresh set of blocks ready for machining. 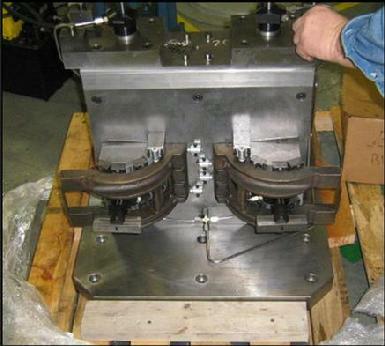 Part changes and deburring are transparent to the machining cycle of the blocks. It has run flawlessly for nearly 5 years now. We designed and machined the fixtures, wrote all the programs, tooled the machine and did quality runs, prior to turning the job lose for production. Quality Products, at a fair price, on time.